The research for my PhD and Cyprus Case Study has facilitated engagement on the subject of animal suffering by a priest and two hierarchs of the Orthodox Church. All offered interviews in order to address and clarify some of the problems highlighted in the research. This in turn led to further engagement by Bishop Isaias and resulted in a meeting with leading animal protectionists on the island – Cyprus Voice for Animals. At the end of this meeting the Bishop made a request for a formal letter outlining the problems in Cyprus. This letter was presented by Bishop Isaias to the Holy Synod in Cyprus where discussions took place and led to a formal letter of response by the Holy Synod of Cyprus to the C.V.A. (see below). 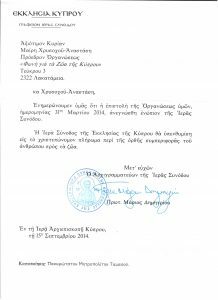 This declaration clearly states that cruelty and abuse to animals is of concern to the Orthodox Church in Cyprus and further, it notified the protectionists of the Holy Synod’s intention to inform their parishioners of the proper care for animals in a forthcoming statement. On July 27, 2014, CVA President Mary Anastasi, Secretary Stella Stylianou and spokesman Mr. Dinos Agiomammitis, visited Bishop Isaiah at the Bishopric of Tamasou and Pera Orinis. Accompanying us was Mrs. Christine Nellist who arranged the meeting and who has been striving for animal welfare and animal rights for many years. Fearing the possible reluctance of the Church to tackle matters concerning animal welfare, a subject that is not popular and many times unpleasant, we were doubtful that this visit would prove otherwise. It was indeed a great and pleasant surprise to hear Bishop Isaiah’s affirmation that animals are part of God’s creation and their welfare secured. We left the meeting with the best impressions and hopes that the Church will finally embrace animals. On the advice of Bishop Isaiah, we wrote a letter to the Holy Synod, explaining the current situation and asking the Church to address the people on the subject of animal cruelty. 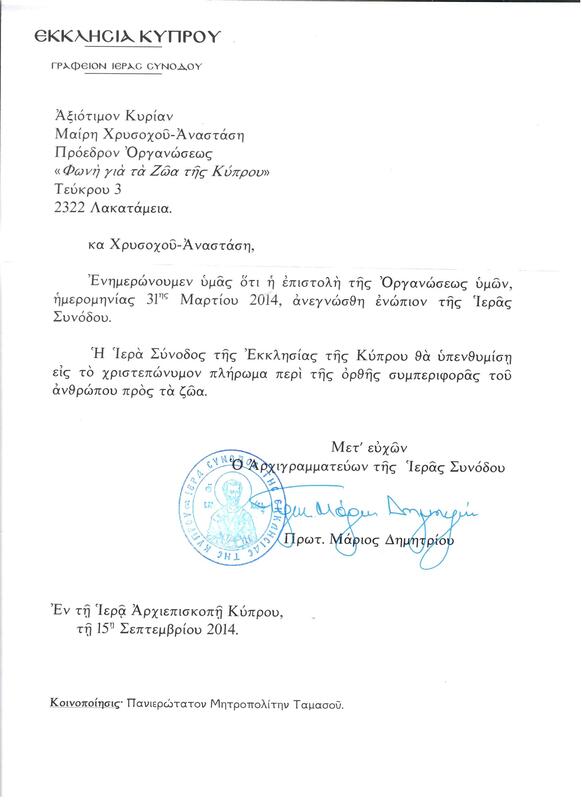 On September 24, 2014 we received a letter from the Holy Synod, dated September 15, 2014, pledging that the Church of Cyprus will remind its Christian followers, the proper way of treating animals! This news is indeed a historic step in the right direction and one that we have all been striving to achieve. We believe that the involvement of the Church in matters of animal welfare will bring desired changes in attitudes and to unorthodox practices. We await with excitement to hear the so-long awaited announcement. We would like to thank Bishop Isaiah for his most warm welcome and of course his positive views regarding animals and their welfare as well as his eagerness to present this subject to the Holy Synod. Of course we wholeheartedly thank Christine Nellist for her persistence with the church as well as her oratorical guidance of the clerics.